Cows and cattle lowing, sheep bleating, voices raised, dogs barking, arguing in the throes of buying and selling, large sums of money exchanging hands, children running too and fro, men and young boys with ash plants and torches shouting and cajoling their animals to move forward to catch the early buyers – this was a typical scene of real havoc on fair morning. Cattle and sheep fairs were held on the 2nd Thursday of the month and the horse fair twice a year. Cattle and cows were lined up along the streets. 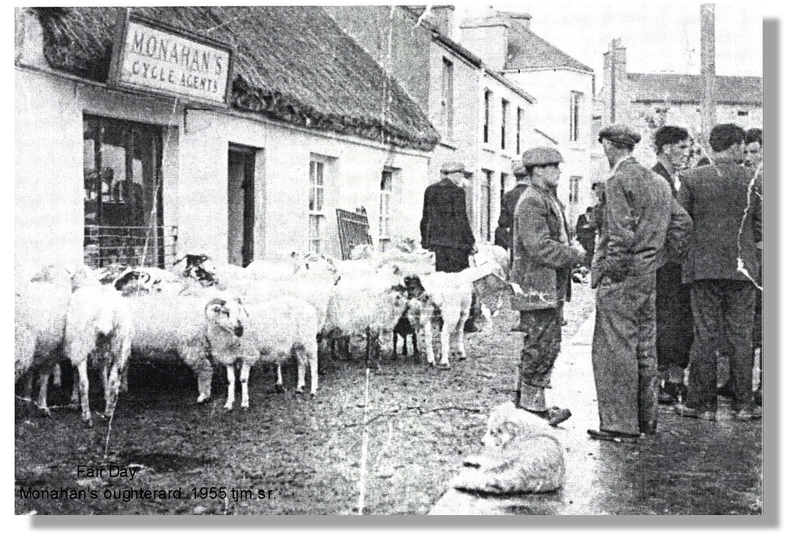 Glann animals stood in Camp Street, Kilannin /Collinamuck animals in Corribdale and the Connemara cattle occupied the Main Street to Angler’s Hotel. Jobbers, shrewd operators with tremendous skills of bargaining moved from fair to fair, trading livestock. Jobbers would travel out the roads leading to the town early in the morning hoping to catch an unwary farmer and perhaps strike a good bargain. Farmers always hoped to sell early as bargaining could go on all day with much ‘to-ing and fro-ing’. Often a middleman would mediate between farmer and jobber. There was much spitting and clapping of hands before the final agreement on the price of the animal was agreed. “Luck money” was part of the deal – the man who sold was expected to give money back to the buyer to wish him luck with the animal. This whole process displaying debating skills, oratory, one-up-man-ship often went on for hours surrounded by an admiring circle of onlookers. The jobbers paid out the money in Joyces and Keoghs bars. The Bank of Ireland operated from where Kenny’s bar is to day. Harry Walsh and Martín Thornton were jobbers in this area. Jobbers carried large wads of notes tied together with string or elastic bands. Tommie Mallon found such a wad of £1000 one day and he handed it over to his mother Annie. Shortly afterwards Mairtín paid her a visit. “Had you a good day at the fair”? Annie enquired. “I had an awful day Annie, I lost an awful lot of money”, replied Mairtín. “Tommie found money. Was it in a bundle with two elastic bands”? asked Annie. “Yes”. She handed over the wad of notes. Mairtín didn’t hesitate but pulled out two £50 notes and gave them to me”, said Tommie. This was a small fortune in those days. Annie Farrell and Mrs Conneely served breakfast and teas on Fair Day. Rashers, eggs and sausages were served for breakfast, boiled lamb, cake bread and fresh loaf from Byrnes bakery was served with tea. Drinking was part of the occasion as farmers renewed old acquaintances over frothy pints while they smoked their pipes or chewed tobacco and spat continuously. Sawdust and straw was thrown on the pub floors to absorb the muck carried in from the streets. D.H. Joyce was very strict on how people behaved in his bar. He didn’t tolerate any messing. If there was any sign of rowdiness he would close the doors immediately. The pig fair was held on the third Thursday of every month. People drove the pigs to town or they were carried in a horse and cart. Bonhams were held in a small truck with a hatch or contained in a box to prevent them wandering. Pigs are thick- skinned stubborn animals. The early morning air was filled with grunts and squeals and perfumed with pungent farmyard smells. Baby bonhams squealed and protested at being poked by jobbers testing their potential. Sows were usually restrained by reins. The pigs often created chaos by paying unwelcome visits through open shop doors. The late Sheila Morley often told the story of a pig sliding around the bar. She slid in the front door of the Boat Inn and Sheila chased her out the back door. Kevin O Connor and the late Sean Conneely, Michael John Mc Donagh and Higgins Hotel sold their pigs in the 70s to Ted Corbett from Headford at Kinneavey’s old pub. It was a custom in this area that householders reared two pigs one for the house and one to make extra cash. Pigs were slaughtered, salted and the meat was shared with the neighbours. Premises were boarded up to protect the shop windows but often a stray animal would wander into the shops. 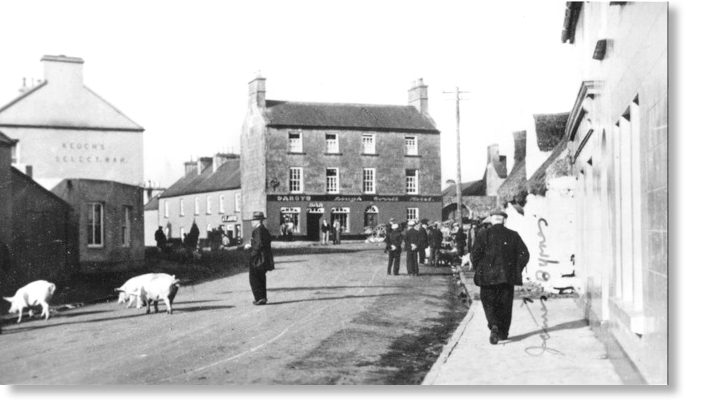 A bullock walked through Joyce’s shop window causing considerable damage. They never found the owner of the bullock. People left their shopping behind the counter and would collect it when the fair was over. Suspicion was aroused when a large box was left unclaimed for several days. Finally when it was inspected it contained 6 bottles of Poitín!! The rightful owner never came forward. County Council workers spent days cleaning the streets. Before hoses were invented they threw buckets of water from water barrels drawn by horse and cart, scrubbed and cleaned footpaths, walls of houses and doorways with yard brushes. Shop floors were scrubbed with hot water jeyes fluid and washing soda to remove the day’s grim. County council workers cleaned and hosed the streets. Fair days and market days were busy trading days in the town. Mrs Mallon sold herring, mackerel, whiting, cod, plaice, ling and smoked haddock on fair days as well as every Friday and Thursday. 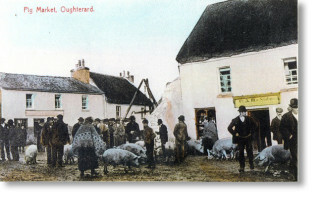 The fish arrived from Nolan’s – fish-mongers in Dublin by early mail train to Galway and then it was delivered to Oughterard by mail lorry arriving in Oughterard by 10.30am. Annie purchased fish too from Festie King Clifden. The fish came fresh, contained in timber boxes and it was salted to preserve it. The fish that was unsold it was gutted, prepared and cured in brine (half salt mixed with half water) and stored in barrells. If cured properly it would last a year. Herring was held over until Lent when there was great demand during the Lenten fast. The other great market occasion was the Wool Market held in October. 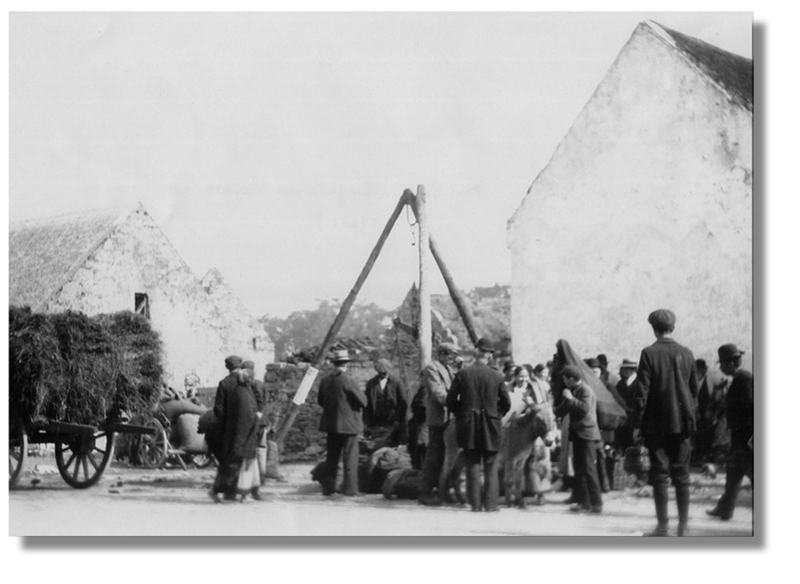 Seán O Farrell, Tommie Mallon’s uncle operated the Weigh Bridge at the square where he weighed the carts of wool. Keoghs and Joyces of Leenane were the local wool buyers. A relation Of D.H. Joyce saw the value of such a weighbridge when he purchased it in 1700s. Tommie Mallon’s grandmother Sarah Joyce married Thomas Farrell and he took over the weighbridge in the 1800s and the Farrell family ran the business of weighing farmers’ produce. The first general meeting of the Oughterard and District Tourist and Development Association that was held in the Muintir na Tíre Hall (Old Hibernian Hall, Camp St.) on the 17th January 1968. The newly elected committee’s first project was the removable of the fairs from the streets to a new site in Crorribdale. This proved a difficult task as there were many vested interests in maintaining the field as a Cow Park. Negotiations went on between the trustees of the field and the County Council until 1974 until finally the fairs were transferred there. Some modern cattle marts replaced Fair Days. A special word of thanks to Tommie Mallon and to all those who supplied information for this article. If any of the readers has a story to tell of bygone days we would be glad to hear it. As a teacher in the locality, this site has been of huge benefit when trying to teach the children about local history. Using the information on the site about Fair day, thechildren each wrote their own Fair Day related story and illustrated it. Our 6th class then edited the work, and using publisher they then created an Oughterard Newsletter, agricultural edition. Thanks for all the good work and providing such a wonderful resource! !